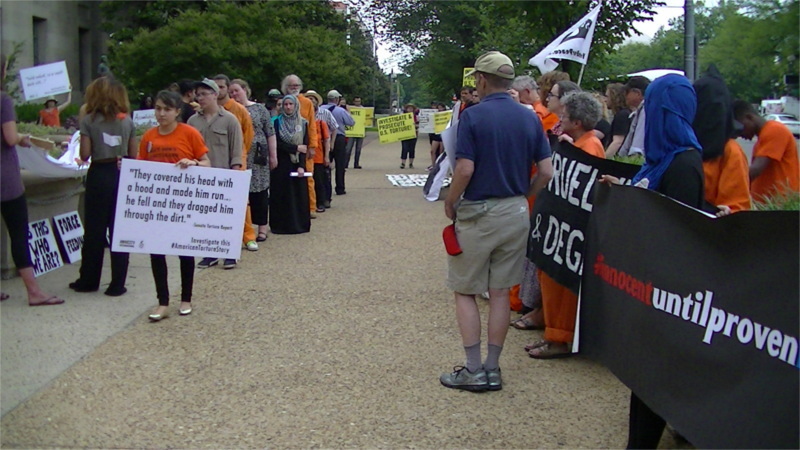 On the 26th of June, Amnesty International, Witness Against Torture, and others showed up at the Dept of Justice to denounce continuing US torture. The DOJ was called out not only for refusing today to prosecute torture at Guantanimo Bay and elsewhere but also for explicitly authorising it during the Bush years. During the protest, flowers were laid on the concrete barrier planters outside DOJ memorializing those who died under torture in US custody. On the 26th of June, cops and city workers were met with barricades as they arrived to evict a homeless camp under a Baltimore freeway overpass. The campsite is at Martin Luther King Ave and Mulberry st, sheltered by the freeway overpass. Using civil disobedience, activists sought to defend the camp from this assault by the forces of wealth and urban removal. On the 23ed of June, the Senate voted to cut off debate on the "fast-track" bill for the TPP, TISA, and TTIP trade treaties. The proposal only needs 50 votes to pass in Wednesday's final vote. 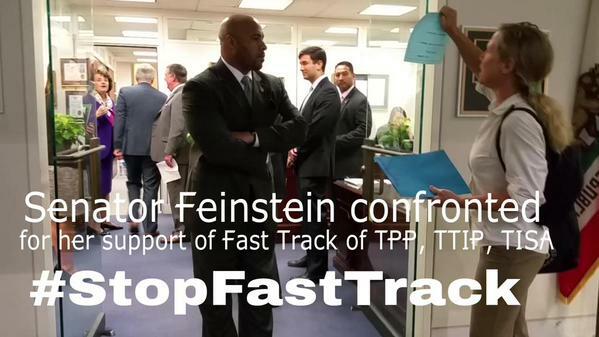 Beyond Extreme Energy confronted Sen Dianne Feinstein in her office over her support for TPP fast-track while other activists took up a position on the corner of the Capitol grounds. Just after 11:30AM, the 60th vote to cut off debate was cast. 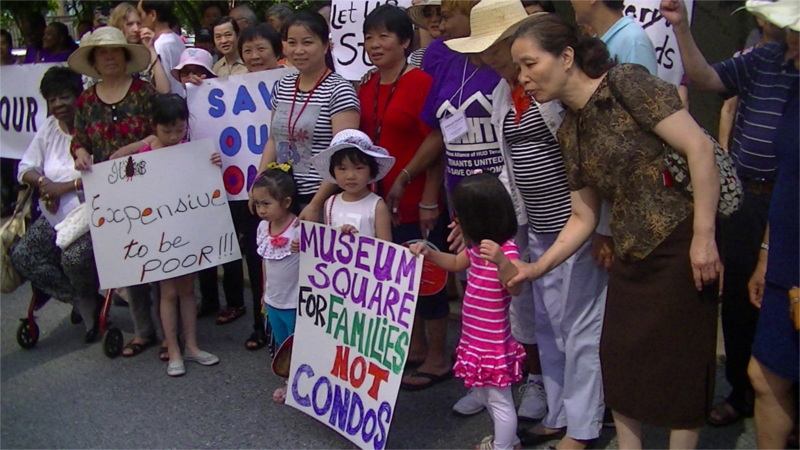 The residents of Museum Square, one of the last Section 8 rentals in Chinatown are facing mass eviction followed by demolition and condo construction. Bush Companies (of Williamsburg, Va.), the landlord, offers only an option to buy the building for nearly ten times what the DC government assessed it as being worth for property taxes. On the 23ed of June, the tenants staged a mass protest against the planned evictions. They were backed by the National Alliance of HUD Tenants. 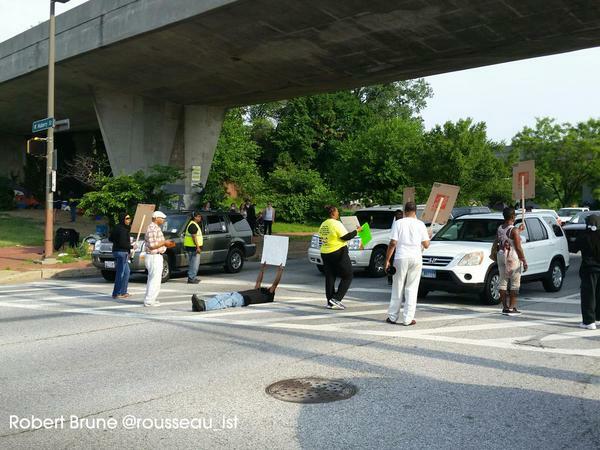 On the 21st of June, DC Ferguson marched in solidarity with African-Americans in Charleston, S Carolina. On June 17, a white supremacist invaded the Emanuel African Methodist Episcopal Church in Charleston and opened fire. Nine people were killed and one more person wounded. 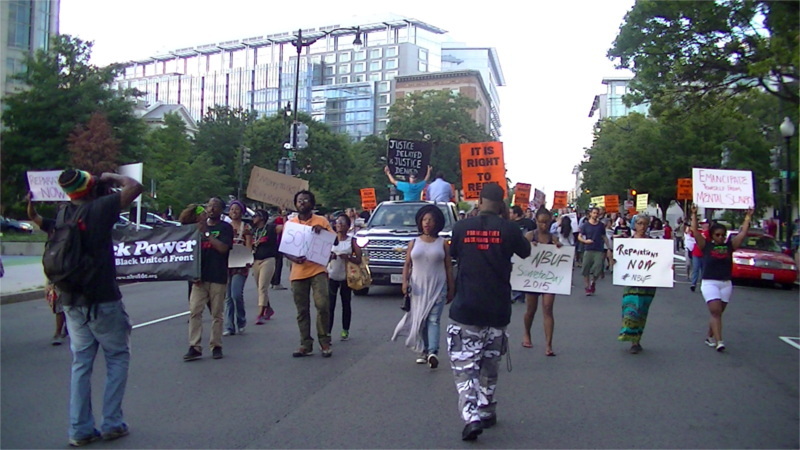 Signs in the DC march read "Stop the war on Black America." On June 21, the DC Food Justice Bike Tour visited a number of locations with economic and food justice significance. The first was a Ben and Jerry's outlet in Georgetown, where the Milk with Dignity campaign is seeking higher wages for dairy workers in Vermont. This campaign is following in the footsteps of the sucessful Coalition of Immokalee Workers campaign for higher wages in tomato fields. Ben and Jerry's is a major customer of the dairy factory farms in Vermont, just as Burger King is a major customer of tomato producers. 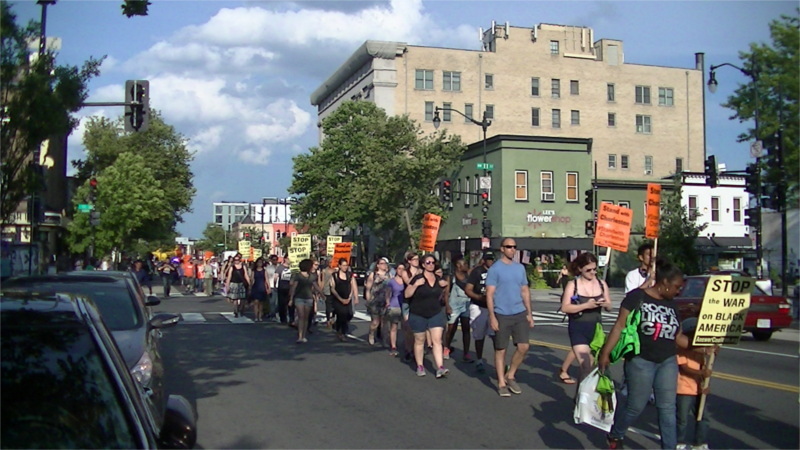 On the 16th of June, DC Ferguson returned to the streets and shut down Chinatown, demanding not only that Police Chief Lanier keep the de facto promise she just made to end jump-outs, but also an end to gentrifcation and homelessness. The 16th of June was the 39th anniversary of the Soweto Uprising that marked the start of the movement that ultimately ended Apartheid in South Africa. 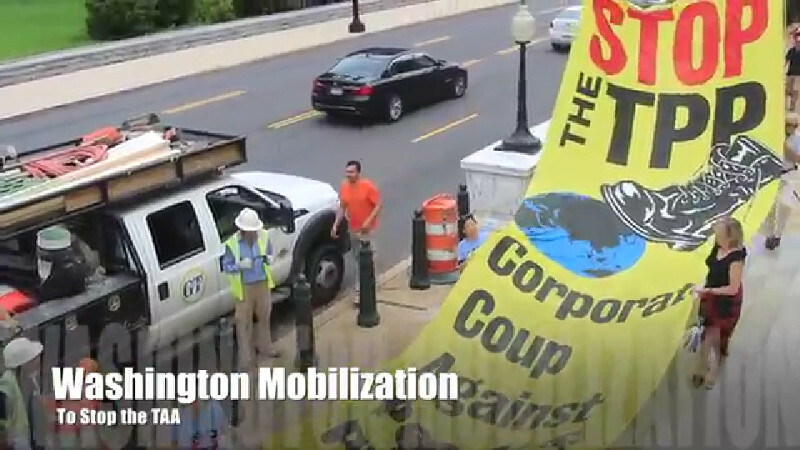 On the 15th of June, protesters from a number of groups marched on Capitol Hill, demanding NO COMPROMISE on the TAA "Trade Assistance Authority" bill without which passage of TPP/TTIP/TISA fast track is considered impossible. Both Flush the TPP and Feminist Majority Foundation were well represented. Not long after, the vote on TAA was put off to an unspecified time between now and July 30 in an attempt to keep the deal alive. This was because Boehner now fears that an actual vote will be a no vote, ending almost any chance that the TPP trade deal will be finished or ratified while Obama remains in office. On the 15th of June, the Smithsonian's Board of Regents met at the museum's "castle." 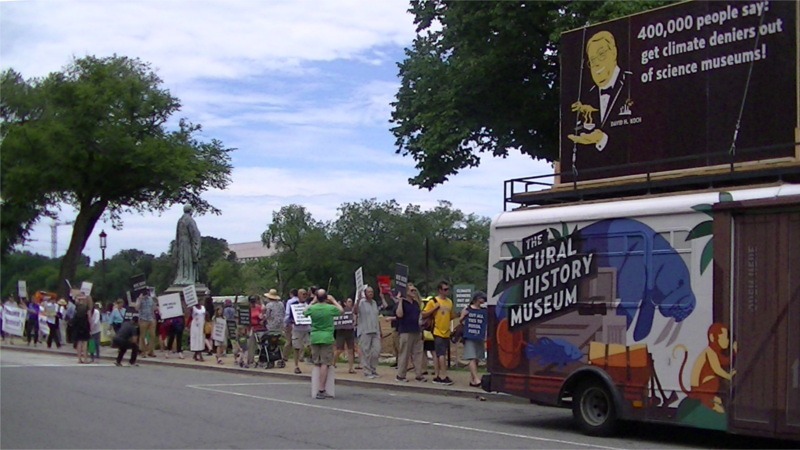 Outside were climate activists demanding the removal of David H Koch from the boards of both of the Smithsonian's Museums of Natural History (DC and NYC). In addition, they demanded the Smithsonian reject financial contributions from the Koch Brothers, who have spent billions on climate change denial. The activists delivered four boxes filled with petitions asking the Smithsonian to cut ties with the Koch's to the board meeting, they were accepted by Smithsonian staff. On the 14th of June, Climate First! 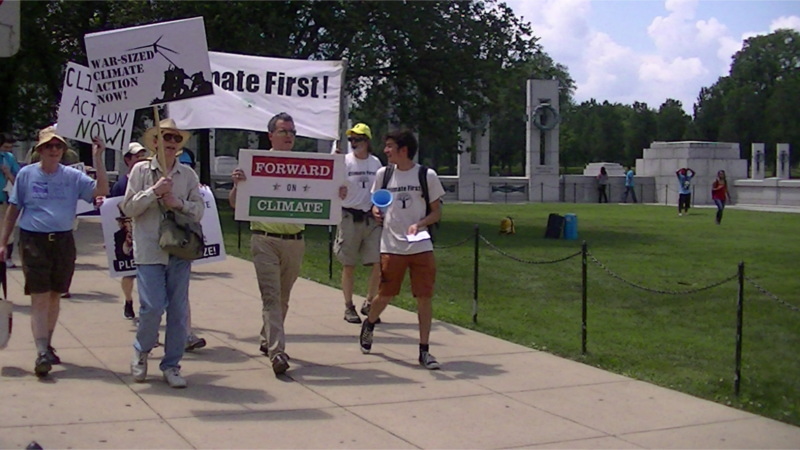 hosted one of a national series of Climate Mobilization marches demanding that the same level of effort put into the Second World War be applied to climate change. Activists marched from the WWII memorial to the White House, some with WWII style "Rosie the Riveter" posters concerning climate change.